Professor Adam Bargteil was elected to a three-year term as director-at-large for ACM SIGGRAPH, the premier professional organization for computer graphics and interactive techniques. Dr. Bargteil completed his Ph.D. in computer science at the University of California at Berkeley, where he worked in the Berkeley Computer Animation and Modeling group. Before joining the UMBC CSEE department, he spent two years as a postdoctoral fellow in the Graphics Lab at Carnegie Mellon University and was an assistant professor in the School of Computing at the University of Utah. His primary research interests are in computer graphics and animation, especially using physics-based animation. He is also interested in scientific computing, numerical methods, computational physics, and computational geometry. SIGGRAPH is a special interest group of the Association for Computing Machinery (ACM), the world’s first and largest computing society. Since its beginning in 1974 as a small group of specialists in a previously unknown discipline, it has evolved to become an international community of researchers, artists, developers, filmmakers, scientists, and business professionals who share an interest in computer graphics and interactive techniques. As a director-at-large, Professor Bargteil will be part of a nine-person committee charged with steering the organization on its mission to foster and celebrate innovation in computer graphics and interactive techniques. Like all voting members of the ACM SIGGRAPH Executive Committee, directors-at-large are elected by the ACM SIGGRAPH membership. Image: Marc Olano during the opening of the 3D Scanning Room at UMBC. Photo by Marlayna Demond ’11 for UMBC. CSEE professor Marc Olano talked at TEDx Towson on how technology has changed how we think about reality. “New technology has started blurring the lines between the real and the virtual,” he said at the May 5 event. He focused on how new 3D technologies have evolved and used examples including 3D graphics, virtual reality, video games and 3D printers. Professor Olano ended his talk pointing out that while he had not mentioned science fiction, “I can feel the world of holodecks and replicators on the horizon.” Read more about his TEDx talk at UMBC News and watch it on YouTube. CSEE professor Penny Rheingans has been elected to the Computing Research Association (CRA) Board of Directors. She will serve a three year term. Dr. Rheingans is a Professor of Computer Science and Electrical Engineering and Director of the Center for Women in Technology (CWIT). As CWIT Director, she oversees a scholarship program for undergraduates committed to increasing gender diversity in the technology fields and develops programs to increase the interest and retention of women in technology programs. She received a Ph.D in Computer Science from the University of North Carolina, Chapel Hill and an AB in Computer Science from Harvard University. Her current research interests include the visualization of predictive models, visualization of data with associated uncertainty, volume rendering, information visualization, perceptual and illustration issues in visualization, non-photorealistic rendering, dynamic and interactive representations and interfaces, and the experimental validation of visualization techniques. The CRA was founded in 1972 as an association of more than 220 North American academic departments of computer science, computer engineering, and related fields; laboratories and centers in industry, government, and academia engaging in basic computing research; and affiliated professional societies. Its mission is to enhance innovation by joining with industry, government and academia to strengthen research and advanced education in computing. CRA executes this mission by leading the computing research community, informing policymakers and the public, and facilitating the development of strong, diverse talent in the field. CRA’s Board of Directors is a distinguished group of leaders in computing research drawn from academia and industry. Its members serve on CRA’s standing committees and lead the organization’s responses as new issues affecting computing research arise and evolve. TechRepublic identified CSEE professor Marie desJardins as one of “10 artificial intelligence researchers to follow on Twitter”. Check out her feed at @mariedj17. CSEE professor Marie desJardins has received an Undergraduate Research Faculty Mentoring Award from the Computing Research Association (CRA). The award recognizes faculty who have provided exceptional mentorship, undergraduate research experiences, and, in parallel, guidance on admission and matriculation of undergraduate students to research-focused graduate programs in computing. The award will be presented to Dr. desJardins at the CRA Conference at Snowbird in July. Dr. desJardins is a professor in UMBC’s Computer Science and Electrical Engineering department and Associate Dean of the College of Engineering and Information Technology. Her research is in the area of artificial intelligence, machine learning, and computer science education. Currently, her research group includes six undergraduates and five graduate students. Since 2005, she has mentored over 70 undergraduate students. At least 29 of them have enrolled in graduate programs in computing, with eight of the 29 having pursued a Ph.D. in computer science. This is the first year for the CRA Undergraduate Research Faculty Mentoring Award, which was also given to Pieter Abbeel of the University of California, Berkeley and Judy Goldsmith from the University of Kentucky. Founded in 1972, CRA‘s membership includes more than 200 North American organizations active in computing research: academic departments of computer science and computer engineering, laboratories and centers (industry, government, and academia), and affiliated professional societies (AAAI, ACM, CACS/AIC, IEEE Computer Society, SIAM, USENIX). Its mission is to enhance innovation by joining with industry, government and academia to strengthen research and advanced education in computing. CRA executes this mission by leading the computing research community, informing policymakers and the public, and facilitating the development of strong, diverse talent in the field. Read more about her TEDxBaltimore talk here and see is starting at 25:50 in this video. This past weekend, Dr. Rick Forno, CYBR GPD and Assistant Director of the UMBC Center for Cybersecurity, joined Dr. Matt Blaze (UPenn), Dr. Jeff Foster (UMCP), and COL (Ph.D) Greg Conti (USMA) on the closing plenary panel for Schmoocon 2016 in Washington, DC. ShmooCon is an annual east coast hacker convention offering three days of an interesting atmosphere for demonstrating technology exploitation, inventive software and hardware solutions, and open discussions of critical infosec issues. The first day is a single track of speed talks called One Track Mind. The next two days bring three tracks: Build It, Belay It, and Bring It On. CSEE Professor Gymama Slaughter will talk about her research on Human Powered Biosensors as part at the 2016 TEDxBaltimore conference in January. The one-day conference will be held at Morgan State University on January 14, 2016 with the theme OUTLIERS: ideas that challenge traditional thinking. She will join about 15 other speakers each sharing an “idea worth spreading” with the expected 1,500 attendees. Dr. Slaughter’s research focuses on the application of sensor-processor integration, bioelectronics design and theory, optimization methods for physical circuit design, biologically inspired computing (neural networks), and sensor interfacing and wireless networking and communications. You can find out more about the work that she and her students are doing by visiting her Biolectronics Laboratory website. 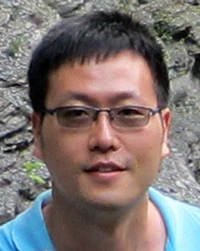 CSEE professor Ting Zhu received an award from the National Science Foundation to develop improved techniques for identifying a person’s location in dynamically changing environments. The award of $250,000 will support the three-year research project, Real-Time Indoor and Outdoor Simultaneous Localization and Mapping. Location-based service was ranked number one for the top technology trends by a recent survey in Time magazine, with potential applications in the area of location-based advertising, recommendation, navigation, asset recovery, and gaming. While many companies are working to improve location-based services, most existing indoor and outdoor maps are relatively static. In reality, many indoor and outdoor environments are highly dynamic, raising the need for novel techniques and systems to improve simultaneous localization, mapping, and navigation in modern cities. Moreover, in tasks such as disaster recovery, teams of individuals must cooperate with one another and benefit from accurately knowing their relative positions. Dr. Zhu’s project introduces a holistic approach for providing real-time, light-weight, and accurate relative positioning to detect peers in both indoor and outdoor environments. The research will advance the development of both the theoretical foundations and practical algorithms for simultaneous localization and mapping.